RacerX Gullwing was patient with me when I started asking him about the Giant Snail Races in Second Life. He just handed me a notecard with the history of the event. At first I thought I was being politely dismissed until I started reading it, and then I realized that this weekly phenomenon has been going on for over three years. That's a lot of explaining he's been doing... so much so that this bunny's name is synonymous with "snail races." The first thing you need to know is that you, too, can become a snail and participate in the "Greatest Race in the Known Universe." This Saturday, March 15th at 2pm SLT, the first of 4 cross-country races to raise money to find a cure for cancer will be held, crossing 45 sims... and the privilege will cost you $250L. It is all part of the official kick-off of the Relay for Life. Another factor you should consider is that this Saturday - whether you are in the race or not - you run the risk of being bulldozed by dozens of giant snails as they hurl their slimy way across the grid. 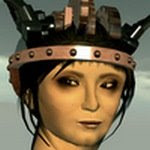 It all started with a contest called Giant Avatar contest I saw was coming up in a few days back when events were only a few a day and finding them was easy. I went to the sandbox where you could usally work for about 30 minutes at a time between sim crashes, and started attaching prims to my feet, but that didn't make you any taller... just made prims that went into the ground. I thought about it and figured the way I'd have to do this is be in the foot. I didn't have a clue how to script legs to move and back then movement scripts didn't work on avatars anyway. I narrowed it down a bit to a one footed animal. The shell was maxed out at 30 meters or maybe I just remember it that big. Thing is, I din't have a clue how to see out of that so had to stop a lot and cam outside the shell to see where I was. It was hilarious. I got to the contest about 20 minutes early and the guy holding it told me to please park off to the side somewhere. I thought he was steering me over there because I had obviously won and he didn't want to discourage the other avatars. Ends up I was the only one that took him up on it - literally - and made a giant avatar. Well I didn't win. I was in group called Montmartre Artists and we were trying to get on the most popular places list and come up with an event before camping chairs were invented. I was talking with my good scripting friend and neighbor in Fujin, Catfart Greyson, and he suggested giant snail racing. I put together a better, cuter avatar with blinky eyes that everyone loves and they havent changed much since. We did get into the top 20 a couple times. The races started on the ground on the stone paths that circled Montmartre. I made all the arrows and things needed for the race, and later, At 8pm on Tuesday nights, I'd go around after the race and shout "the race is over," and all of the signs of the race track would vanish, just leaving the stone path built by May Best, the city streets of Chase Rutherford's Manhattan, and the Hawthorne sim, an Aimee Weber build. These came to an end mostly because people discovered a trick around the physics in Second Life where, if you can find something to trip over, you can fall a lot faster than anyone can run. Also, once you get into that falling state you can close the chat bar and hold the space bar down and get yourself to glide a long ways. So I moved the race up to the sky onto a perfectly flat surface where there is nothing you can trip over. At the same time, Seifert Surface was experimenting with a transportation system that used "push" and would throw you across the map. He had set up the flingers at the Future sim, just one sim south of Montmartre and owned by Chase Rutherford. I used his experiments at the new track, and built the course around them. The race stayed in the Future sim as it changed hands to Gus Plisskin, who said it was welcome to stay as long as I wanted to have it there, but the sim slowly filled to capacity and had a lot of scripts going and the flingers stopped working consistently and the sport became more of a luck thing and more of an endurance race. I got Seifert Surface to give me a copy of his experiments and carefully packed it all into a prim and moved it all back to where it started in Montmatre. Also if you go to Snapzilla and search using the key words "snail race" you can see 99 percent of that history there. The snail race is only a few months older than Snapzilla. In fact, the snail races were three years old at the end of november, 2007, and have been held every Saturday since then, except for two or three cancellations a little over a year ago when I was very sick. Meanwhile, SLCN.TV - the world's first virtual TV network - has been covering (and streaming live) the Giant Snail Races every Saturday since August of 2007. I spoke with SLCN.TV's Texas Timtam to learn more. Texas Timtam: We just thought they were pretty special and started turning it into a "TV Show." RacerX was agreeable and although it has taken a little bit of time, it is becoming more and more popular. 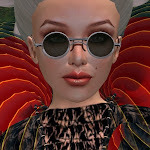 I just think that RacerX is one of the really special people in Second Life. He has such a youthful sense of humor and fun. I just love it on the shows when he laughs. Bettina Tizzy: Where in the world are the folks from SLCN.TV? Texas Timtam: We are in Australia and have to get up pretty early on Sundays to do these races. Sometimes we think.... "I JUST WANT TO SLEEP MORE," but I'm always really happy that we don't. Bettina Tizzy: So what time do you start working? Texas Timtam: Depends on the Daylight Savings situation. It *was* a 6:00 am start (= 11:00am SLT) until last week. Now it's 5:00am, and when we switch off of Australia's DST it will be 4:00 am!!!! Boo hoo I say! Darn this planet thing for being so big and round. Bettina Tizzy: Thank you so much for making this abbreviated video and posting it on YouTube. The still pics do not do the races justice, and the commentary is almost as hilarious as the race itself. Texas Timtam: Wiz Nordberg is a funny guy. Never use the words garlic, butter, or salt in the shows! Bettina Tizzy: How long are the races on Saturdays? Texas Timtam: There are beginner training classes at 9:30am, and the races start at 11:00. They usually go for about an hour and 15 minutes. Be sure to see the new Alice in Wonderland course. 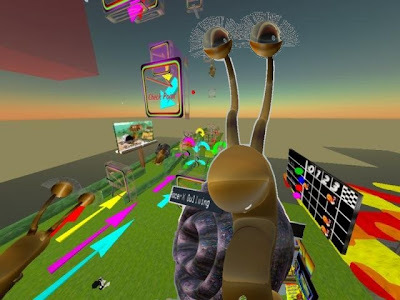 To participate in tomorrow's Relay for Life race, contact RacerX Gullwing directly and pick up your Giant Snail avatar at Montmartre by teleporting here, which also happens to be the official headquarters for the Giant Snail Races. 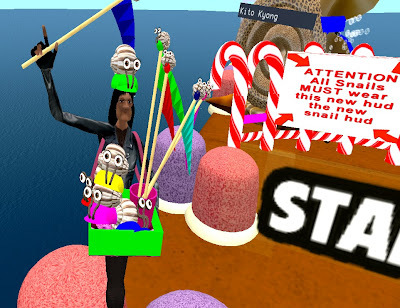 Avatar puppeteering for Second Life in 2008? Dear Amazing Content Creators: Can you make this? Pavig Lok's "Intellectual Property Garden"
It's a Madcow (Cosmos) Madhouse! html on a prim - What can it mean for the future?